The Dura-Trel Camelot Planter Arbor combines the elegance and style of the Camelot Arbor with the convenience of having two Large Planter Boxes attached to the base. The Camelot Planter Arbor is the perfect combination to create a wonderful display anywhere in your garden. Simply add flowers and vines to the rot-resistant vinyl planters and train the plants by weaving them in and out of the arbor to create your own unique, dynamic design. This attractive combo will add beauty, elegance, and style to your home year after year with no maintenance. Dura-Trel arbors and planters are constructed of the highest quality vinyl, which contains the greatest concentration of Titanium Dioxide available. Titanium Dioxide is a powerful UV stabilizer that protects the vinyl from the harmful ultraviolet rays of the sun. 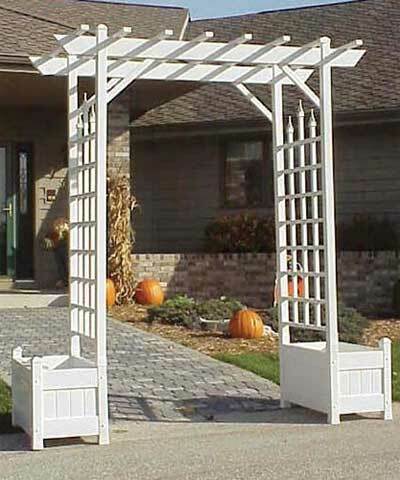 This arbor and planter will never fade, crack, peel, or rot and there is no need to paint them. Assembly required. Made in the USA. Twenty year guarantee.